The Chilipepper is one of the hottest new bathroom accessories bringing your hot water from your water heaters to your fixtures quickly, and when you turn on the faucet you have instant hot water without running water down the drain. You save time, you save water, AND you get to feel GOOD about conserving one our most precious resources! It is truly a green bathroom accessory! Wait! You save money! The Chilipepper can pay for itself in water and energy savings in as little as six months. By reducing your water consumption you reduce the energy required to pump and treat the water. Treating and pumping the water requires large amounts of energy. Generating that energy results in the emission of green house gasses into the earths atmosphere. Whoever heard of a water saving device or bath room accessory that actually adds convenience, instead of being inconvenient like low flow shower heads and 1.5 gallon flush toilets? In many cases a Chilipepper bathroom accessory can provide quick hot water to several or even all of the hot water fixtures in your home. It depends on how your house was plumbed when it was built. A Chilipepper appliance installed under a bathroom sink will cover the shower as well. And if you have two bathrooms back to back, or one above the other, the Chilipepper will cover both. Put a remote button next to your alarm clock. In the morning when you shut off the alarm, touch the Chilipepper remote button too, and when you get to the bathroom the hot water will be ready and waiting for you…instead of you waiting for the hot water. Remodeling your bathroom and adding a tankless water heater? 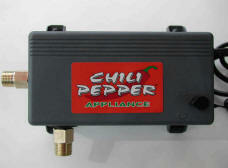 The Chilipepper works great with tankless and with solar water heaters too! Since the pump produces 2 to 3 gallons per minute of hot water flow, it easily turns on any instant or tankless water heater. The Chilipepper is inexpensive and easy to install. It also comes with a button and control cable. Remote control items can be purchased individually or packaged with a Chilipepper. See the online order form for more details. Great kitchen or bathroom accessory to add during a remodeling project! Stop waiting for your shower or bathroom sink to get hot water! Turn your bathroom green with a water and time saving instant hot water pumping system as an accessory for your bathroom and shower.